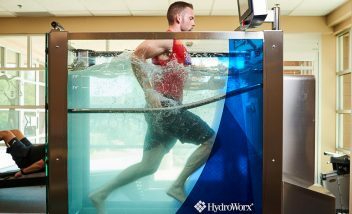 The HydroWorx 300 Series is the benchmark for self-contained, construction-free underwater treadmill devices. Utilizing warm water therapy as a medium to enhance rehabilitation and performance through water’s buoyancy, resistance and hydrostatic pressure, this advanced hydrotherapy system provides warm the ultimate rehabilitation advantage. 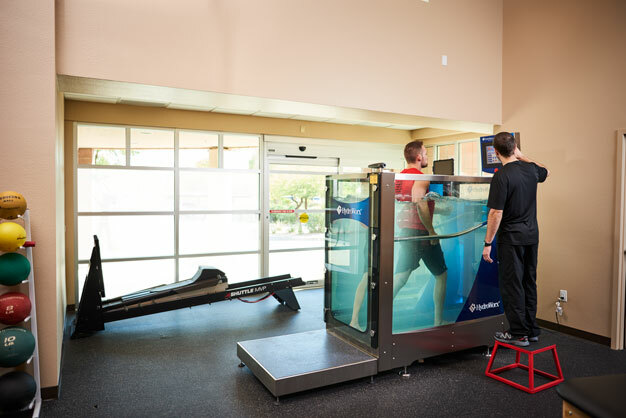 This construction-free unweighting device boasts our underwater treadmill and resistance jet technology. Challenge all planes of motion with enough room to move freely. Requiring a small footprint of existing space, the 300 fits through a standard 36” doorway. 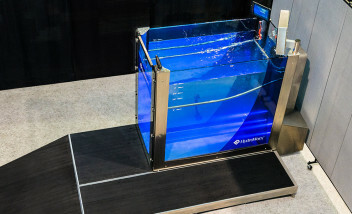 What are the unique features of the HydroWorx 300 Series pools? The variable speed treadmill, which smoothly increases from 0 to 10 mph in safe .1 mph increments, has a cushioned low-impact design with excellent traction. A resistance jet is essential for sports performance training, therapy protocols, swimming or deep tissue massage. The jet has nearly 200 different water speeds to choose from. 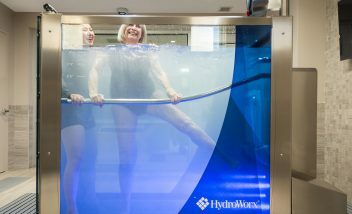 What are a few advantages the HydroWorx 300 technology provides? 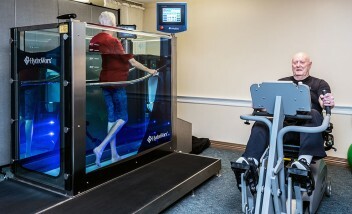 Compared to land-based unweighting treadmills, the 300 offers the same functionality but with the additional benefits of warm water therapy such as buoyancy, the relaxing effect of warm water on muscles and joints, the strengthening benefits of additional resistance and hydrostatic pressure to reduce swelling and promote healing. In addition, the 300 allows you to move and rotate freely with plenty of space to execute multi-planar activities such as forward and backwards walking or running, side shuffle and karaoke. 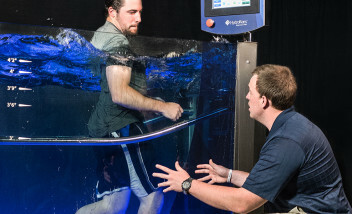 The completely integrated underwater treadmill (speeds from 0 to 10 mph) allows for correct simulation of land-based biomechanics. 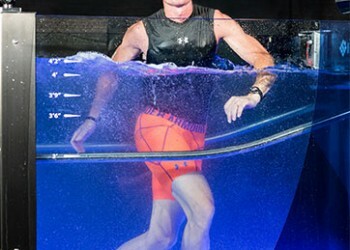 Sports specific exercises such as sprinting, marching, back-pedaling, shuffling, lateral braiding steps and plyometric activities are especially effective when performed on an underwater treadmill. The video system allows the athletic trainer or physical therapist to diagnose gait patterns for immediate corrections. The athlete or patient benefits from being able to see himself or herself on the flat screen monitor and execute the desired protocol faster, thus speeding up the healing process. The adjustable 10” touch screen panel controls all functions of the 300 Series. This gives the athletic trainer, physical therapist, athlete or patient complete control from inside or outside the tank during treatment or conditioning sessions. What are dimensions of the treadmill? How long does it take to fill and empty the trainer tank? Three minutes or less, depending on the length of plumbing runs between the equipment. 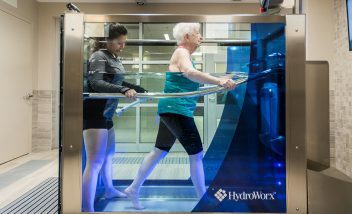 Designed to provide convenient upright hydrotherapy treatment, the functional design of the HydroWorx 300 Series has all the features required for effective therapy, rehabilitation and fitness, all in a package that fits through a standard 36” door. 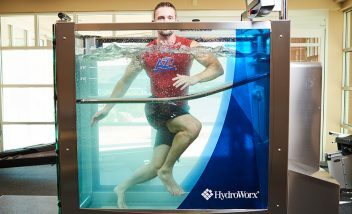 The HydroWorx 300 Series features the same jet resistance technology and underwater, anti-gravity treadmills included in all HydroWorx treadmill pools. The jets provide you with a deep tissue massage, while the standalone underwater treadmill gives you the ability to burn even more calories than you would through traditional rehabilitative exercise. With a compact aquatic treadmill such as the HydroWorx 300 Series, you have all the benefits of running on land, without additional impact and stress on your joints and muscles. With this level of support, you can rest easy knowing your rehabilitation and exercise program is a safe way to avoid the risk of additional injury. In three minutes, the tempered-glass case of the HydroWorx 300 Series fills with water. Because of this speed, your physical therapy session can begin quickly and efficiently. 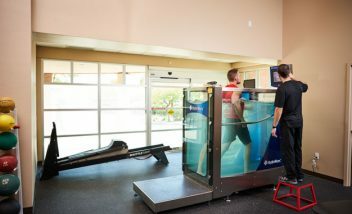 This intuitive and portable underwater, anti-gravity treadmill system allows for easily controlled aquatic therapy sessions. The touch screen interface easily adjusts water depth and underwater treadmill speed and can be positioned conveniently for user or physical therapist. When using the treadmill, users can accelerate up to 10 miles per hour. With optional extras, such as an underwater camera and pediatric handrails, patients of all ages and ability can benefit from this easy-to-operate benchmark product. 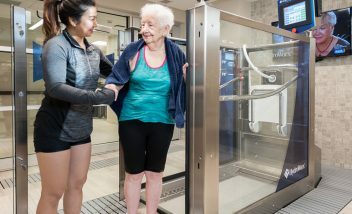 The outward opening door allows patients or athletes easy access to the treadmill, unlike having to climb or be lowered into a swimming pool. 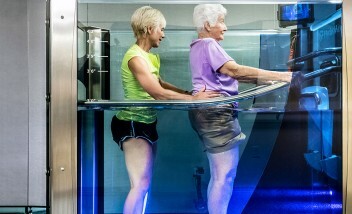 Controlling the water temperature to suit individual needs allows for functional rehabilitation. Warm water can assist circulation, pain management and relaxation, boosting patients’ confidence and mobility. 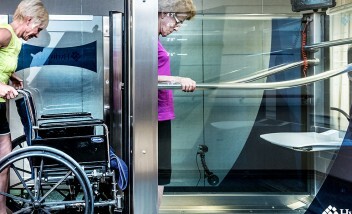 Unlike our competitors, underwater treadmills and resistance therapy jets have been a standard feature in all of our therapy pools since 1998. 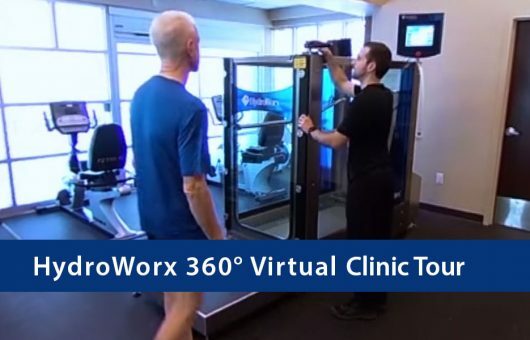 If you’re looking for a trusted brand with products designed by clinicians, and with rehab and fitness in mind, HydroWorx is the elite and affordable choice. All HydroWorx products are serviced by our own, highly qualified HydroWorx-trained technicians. This unparalleled customer service ensures your equipment receives the care and upkeep it needs to continue to provide you with safe workout and rehabilitation conditions.